Fractional yacht ownership is a sensible and more affordable alternative to buying your dream yacht. Exotic locations with convenient transportation, flexible usage plans and managed maintenance mean you can enjoy all the advantages of yacht ownership without all the responsibilities. Eusamarine is testing the waters of fractional yacht ownership with its Global Superyacht Club and is poised to become one of the ultimate luxury yachting opportunities for vacationers. United Kingdom-based Eusamarine has been serving the luxury yacht and fractional ownership industry since 2000 and now has a presence on 5 continents. The company's repertoire includes yachts and bombardier private jets for its members. Eusamarine's Global Superyacht Club offers owner-members 2 options: the Emerald Collection and the Sapphire Collection. Prices vary by collection and by the ownership period. The Sapphire Collection has 4 to 8 owners per yacht, the Emerald Collection has 2 to 4 owners - the key difference is that the fewer owners per yacht the more flexibility and benefits. Fewer owners mean an experience most similar to that of a full owner, according to Eusamarine's Keith Smith. 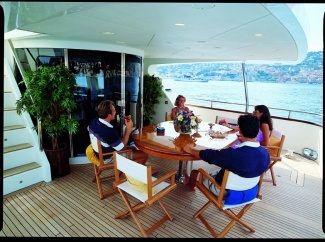 Members in either Collection can also use yachts in the fleet throughout the world. The Emerald Collection fleet includes world-renowned Azimut and Benetti yachts in 6 classifications - 21m, 23m, 27m, 35 and 50 meter. Fractional ownership affords each member 10 weeks each year on the vessel of choice, with unused weeks made available for charter. Chartering unused time helps to offset management and maintenance costs. The cost for membership in the Emerald Collection is based on the initial cost of purchasing the yacht, and owners pay ¼ of the cost, shared by other fractional owners, plus an additional membership fee. The membership fee is paid over 10 years, or the lifetime of the yacht while it remains in the Emerald Collection, whichever is longer. The memberships are priced in euros, and for instance the price of a 1/8 share in a 31m would range from E1.25m to E1.75m, with annual maintenance fees of E140k. Prices for other size yachts can be found at www.eusamarine.com. The Emerald Collection is the most costly and most luxurious of the Global Superyacht Club and is a viable option for frequent boaters and vacationers who want to remove the hassle from yacht ownership and maintenance. Membership comes complete with a personalized captain and crew to attend to your needs and wishes, to create a unique and personally-tailored experience. Eligibility requirements for the Sapphire Collection includes 1/8 fractional ownership of a single yacht in the collection. Membership is very exclusive, as there are only 10 yachts available in each of 6 categories - 18m, 21m, 23m, 27m, 31 and 35 meter. 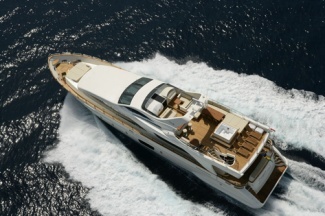 Each member is allotted 5 weeks annually on the yacht, complete with captain and crew. Like the Emerald Collection, Sapphire Collection members can opt to use all of their 5 weeks, or to offer it to other members or charter any unused time. If you charter out some of your time the charter revenue is used to offset your annual maintenance fees. If you're new to the fractional ownership scene, the Sapphire Collection would be a great option to get your feet wet and see if the program is for you. It's also a good choice for those who love the ocean, but don't necessarily have time to vacation frequently. Eusamarine's Global Superyacht Club has yachts across the globe. The current locations include the Eastern and Western Mediterranean, Caribbean, the U.S. West Coast and Dubai, and the company plans to expand into the Northwest and Eastern U.S. and the Far East. See the SherpaReport chart for details on other fractional yacht programs.